Dr Nicola and her team have extensive experience in performing oral surgery to correct a range of mouth and jaw issues. They carry out extractions, including both wisdom tooth extraction and gentle extractions. It isn’t uncommon for clients to experience difficulties with their wisdom teeth, including wisdom teeth that are impacted or partially erupted. If a wisdom tooth is particularly difficult and requires a more intensive procedure, Dr Nicola will refer the client to a local and trusted Oral Surgeon, aiming to give the client the best possible outcome. 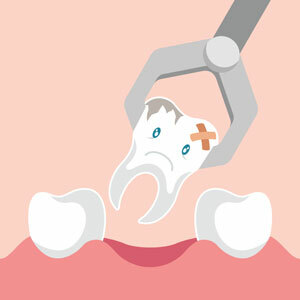 Other teeth may require extraction due to a number of reasons, including tooth decay, root fracture, or trauma beyond repair. Additionally, primary teeth which have failed to fall out may also require extraction if they are preventing the secondary tooth from coming through. While extractions are a common procedure at any dentist practice, Dr Nicola prides herself on only resorting to extraction if it is absolutely necessary. This honest and minimally-invasive approach to oral healthcare is what has clients refusing to see any other dental practitioner! When you give your consent for treatment please be advised that any surgical or invasive procedure carries risk. Contact us today to schedule your appointment with Pure Dental Toowoomba!